Tesla Motors' stock (TSLA) is caught in a wave of hype, leaving Tesla CEO Elon Musk grasping for the best way to describe the company's sky high valuation. The last time we reported on Tesla Motors (TSLA) stock price, last April, it had just broken above $40 a share thanks to good news like posting the first profit in the company's history. Little did we know that today, five months later, the TSLA stock price would be nearing $160 a share, for a 4x gain. Many of us are kicking ourselves for not buying into TSLA at that stock price rally and becoming a Teslanaire. But in a CNBC interview published on Wednesday, Tesla CEO Elon Musk said things about Tesla's stock price that look very bad if taken out of context. Musk really did say to CNBC's Philip LeBeau, "the valuation we have right now is more than we have any right to deserve," and "our stock price is obviously far too high" which surely caught the attention of shareholder class action lawsuits lawyers. But if you listen to his whole statement, rather than the sound-bites, what he said was very reasonable. Theoretically, when the stock market agrees on a stock price, the market is determining a careful and reasoned valuation for a company. Stock price valuation is supposed to be based on a reasoned estimate of future earnings. But in practice the stock market sometimes has darling stocks that fly high based on hype rather than rational valuations. What Elon Musk actually said is that the stock market valuation of Tesla's stock, if taken rationally, means the market believes Tesla Motors is going to succeed beyond anybody's wildest dreams: "I actually think the value of Tesla right now is .. the market is being very generous. And they're obviously giving us a lot of credit for future execution. So we'll do our best to honor the faith the market has placed in us," said Musk. Does Musk believe the valuation for Tesla Motors makes any sense? He can't come right out and say something like "hey y'all, you've bid the company up way too high, tone it down a bit" because that would trigger a shareholder lawsuit. What he did say, stumbling around with the words to make sure he said it the correct way, is: "I really feel that the valuation we have right now is more than we have any right to deserve .. so it's not as though I ... I think we need to make sure we knock the ball out of the park in the coming years." Rather than say TSLA is overpriced, he said that Tesla Motors has got to "knock the ball out of the park" in order to live up to the market's expectations. He closed appearing to say that Tesla's stock price is caught up in a hype bubble, and that the price may well fall if or when the current wave of exuberance falls off: "The market obviously goes through these periods of exuberance and depression. That means our stock has a lot of volatility because it depends so much on what people believe our future execution will be. Our stock price is obviously far too high based on historical financials, or even on current financials, ... So the value is very much based on what the future cash position will be like... as that confidence waxes and wanes we'll see fluctuation in the value of the company." For the first quarter of 2013, Tesla posted their first profit ever after many years of posting losses. 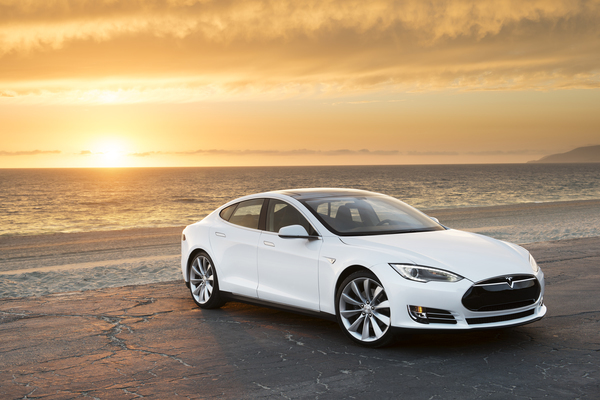 The profit was based on strong sales of the Tesla Model S, and those strong sales have continued. For the second quarter of 2013, the sales continued strong but because of the way sales have to be accounted with the new lease-like financing program Tesla posted a small loss for the quarter. The company is continuing to show strong sales growth, has started to deliver Model S's in Europe, and in generally really does seem to be knocking it out of the park.